The Minister of Education, Adamu Adamu, has appealed to the Academic Staff Union of Universities (ASUU) to call off the ongoing nationwide strike. He made the appeal on behalf of the Federal Government while addressing a news conference on Monday in Abuja, the Federal Capital Territory. 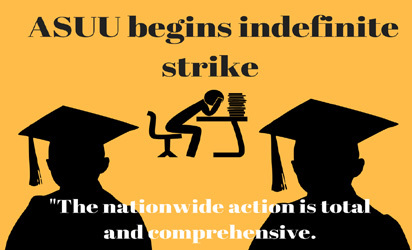 ASUU had announced the commencement of an indefinite nationwide strike with immediate effect over what they described as failure on the side of the government to honour the Memorandum of Understanding, MoU, signed between the union and the federal government in 2017. However, the minister stressed that it was important for the leadership of the union to suspend the industrial action for proper negotiation to take place. “As the Minister of Education, I feel your pain; I share your concern and I am willing to go to any mile so that together we can change the narrative of this country for the better,” Adamu said. He explained that while the government was already engaging the union to address the issues raised, negotiating under the pressure of strike may lead to coming up with agreements that would not be implementable. “For us to negotiate under the pressure of strike, we will end up producing the kind of agreement we had in 2009, which almost all stakeholders have agreed is not easily implementable. “The issue of the release of N20 billion to the universities – on this, let me state in unequivocal terms that I am in touch with the Minister of Finance and that she is very optimistic this will be released in the coming weeks,” he added.